Home » It’s Coffee Time! 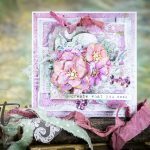 Jennifer Ingle here with you today sharing a shaker card using some great Spellbinders A2 Matting Basics dies and Spellbinders stamps, too! Trim a card base (4¼ x 11″), fold in half, cut and emboss with A2 Curved Matting Basics A Die #7 (the smallest size die is #1). Be sure to place the top edge of the die just a touch over the fold so you don’t cut through the fold, but you get the rounded corners all the way around. 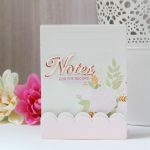 Use A2 Curved Matting Basics A Die #6 and #5 to cut patterned paper rectangles (one in solid peach, the other in polka dots), and adhere to card base. Nest together A2 Curved Matting Basics A Die #4 and #3, and secure with low-tac tape on kraft cardstock to create your frame. Cut and emboss first from the kraft cardstock. Then cut the taped die templates through craft foam to create a foam layer. Cut a sheet of acetate with A2 Curved Matting Basics A Die #4. Layer the cut acetate between the kraft frame and the foam frame. Ink edges of frame. Set aside. Stamp coffee cup on white cardstock and fussy cut around the image. Sprinkle sequins on the patterned paper before adhering the frame. The foam creates your shaker box once you adhere over the sequins. Adhere the frame over the sequins. Adhere the coffee cup to the front of the acetate with foam tape. Trim a strip of kraft cardstock, stamp and emboss sentiment in white, trim into banner shape and adhere to finished shaker box with power tape. 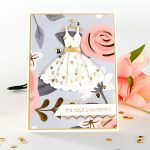 Shaker boxes are such a fun way to add something a little extra exciting to your card designs! They also work great in project life albums and other projects!